-8 Synth parts. 6 parts with each 2 oscillators/sampler, a ringmodulator, 2 analog filters, 1 digital filter, 2 insert effects, 1 VCA, 3 envelopes and 4 random generators. 2 parts with each 1 oscillator/sampler, 1 digital filter, 1 VCA, 3 envelopes and 4 random generators. 8 parts for controlling external MIDI gear. 16 global LFO's and 8 global LFO trigged random generators. Can work as a multi-timbral sound module. 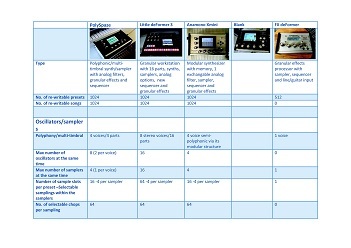 -Analog filter and oscillator FM on part 1 to 6. Oscillator 2 or the digital filter can be the FM source. -Analog filter rseonance has 2 settings: Normal and maximum. The normal setting gives more precise resonance settings, ideal for if you want to copy the sound to other parts, or share them between multiple Spazeboard6's. The maximum setting adds more powerful, but less precise resonance. -8 Audio Tracks. Chops while recording. Playback starts immediately when recording stops, and chops can be rearranged and re-pitched (again: See XXX7 video). Maximum audio track lenght: 32 bars (with track resolution set to 1/2). -Sample time: Either 93 minutes (477MB) or 193 minutes (977MB) of mono sampling (half in stereo), max 8.191 samplings (for both models), kept in super reliable NOR FLASH memory. Samplings and audio tracks are immediately available when turning on -No loading time. 4 samplings can be assigned at a time to each of the 8 sample slots of a preset. These can be selected using the Chop Select parameter. Each sampling can hold up to 64 (non-destructive) chop points. -12 Insert effects (2 for each analog part). Chorus, distortion, bit crush, pitch shift, resonator, stretcher, FM, glitch shift 1, 2 and 3, pitch shaper 1 and 2, FAT, filters 1 and 2, compressor, expandor, delay, roto delay, bright delay, bright roto delay, variator, time stretch, sample pitch. -32 Random generators, 16 LFO's, 24 envelope generators. Imports: Spazeboard6 presets and songs, PolySpaze presets, wav samplings, 44.1 KHz 16 or 24 bit, broadcast wavs, cue points (will be used as chop points or loop points). Exports: Spazeboard6 presets and songs, wav samplings 16 bit, 44.1 KHz. Chop points are exported as cue points, for use with many computer programs. Audio: Stereo out. Left output also functions as a headphone connector. Audio input through analog filter 5 and 6.